We are sole agents for BOGE. 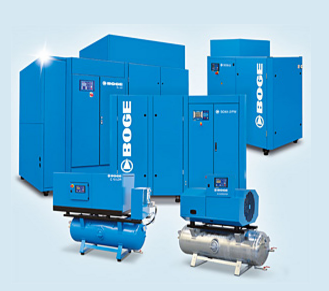 BOGE manufactures a complete range of lubricated and oil free screw and piston compressors from 1 to 480 HP. The full range of products and accessories BOGE enables you to achieve the best solution to every demand of modern industry. BOGE also supplies a complementary range of filters, dryers and condensate management equipment. Compressed air is considered the fourth utility and you can find the BOGE product in most industry sectors, not least, pharmaceutical, food, plastics and steel. Sales, technical and service support are readily available through a growing network of regional distributor sales and service centers having Karrar Technical Services as their exclusive agents. 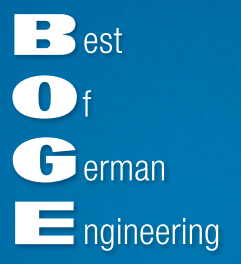 BOGE now has over 100 years of knowledge, experience and engineering expertise to provide you with the perfect quality compressor formula! Proven technology; BOGE manufactures a complete range of oil lubricated and oil free screw and piston compressors from 1 to 480 HP as well as High Speed Turbo compressors.